If you're after a Windows 10 device you can take everywhere with you, the good news is that you've got plenty of choice. Here we're going to compare two of the most interesting such devices to launch in 2018 – the Surface Go from Microsoft and the Swift 5 from Acer. While one is a 2-in-1 and one is a more conventional laptop, they're both likely to be on your shortlist if you're in the market for something that's compact, portable, and able to get stuff done on the go. Read on to find out how the two devices match up in key areas. Best 2-in-1 laptops 2018: which Windows 10 laptop-tablet hybrid is right for you? Credit to the engineering teams at Acer and Microsoft because these two devices are very easy on the eye. The Swift 5 is the lightest laptop Acer has ever put out, tipping the scales at just 990 grams (2.2 pounds) – that's partly due to the special magnesium-lithium alloy the laptop chassis is made out of, according to the manufacturer. Unlike the Surface Go, this is very much a laptop: the 1920 x 1080 pixel display (available in 15.6-inch or 14-inch sizes) is touch-enabled, but it can't be detached from the keyboard. The display bezels have been shrunk to virtually nothing, making this a device that looks good and won't weigh you down. As for the Surface Go, again we're a fan of the tasteful design of this device, particularly if you want to combine it with colour-coded extras like a keyboard cover, mouse, and stylus (all sold separately). This is a 2-in-1 tablet and laptop hybrid, so you will need to buy a Surface Type Cover if you want to do a serious amount of typing. It's lighter than the Swift 5, as you would expect given its compact size, weighing just 522 grams (1.2 pounds) with the Surface Type Cover keyboard clipped on. The Surface Go's touchscreen stretches 10 inches corner to corner, meanwhile and runs at a resolution of 1800 x 1200 pixels – the screen is smaller than the Acer, but it fits a few more pixels in. The Acer Swift 5 doesn't arrive in stores in Europe until November, so at the moment we don't know exact specs. Suffice to say though, with Acer promising a choice of 8th-gen Intel Core i7 processors to fit inside the laptop, you'll be able to configure the Swift 5 up to a very powerful level if you want to (and can afford to). Apparently those processors will be paired with up to 16GB of RAM and 1TB of SSD storage. You know it's going to have some very decent specs, and you know it's going to be super-light, and you know it's going to be running Windows 10 – so you know pretty much everything you need to know about the Acer Swift 5. The Surface Go doesn't quite match the Acer laptop in terms of the power of its components: the entry level Surface Go (which we wouldn't recommend unless you really want to save some money), starts with an Intel Pentium 4415Y processor, 4GB of RAM and 64GB of storage. That's not all that great even by smartphone standards. The next model up, with 8GB of RAM and 128GB of storage, is much more reasonable, even if the processor remains the same. The extra power will be especially useful if you ditch Windows 10 S Mode for the full-fat OS. In terms of the power of the internal specs this is definitely a win for Acer, though of course you'll pay extra accordingly. We've already touched on the key difference in the features of these two devices: the Surface Go is a 2-in-1 that you can use as a tablet as well as a laptop, whereas the Swift 5 is very much just a laptop (you can't fold it over into a tent configuration or anything like that). That alone might help you choose between them. 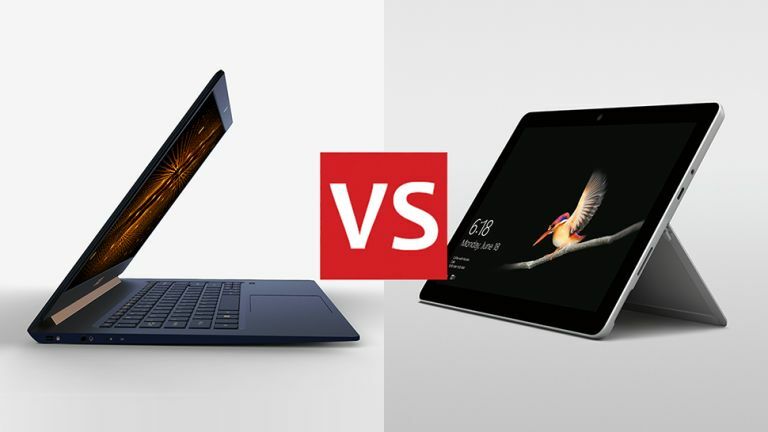 Both have touchscreens, though only the Microsoft device has an officially supported stylus – if you don't want to use your finger, you'll have to take the third-party accessory route to poke at the Acer Swift 5 screen. The Microsoft device is the only one with a rear camera too, if you really think you'd want to take photos with your tablet. As we hinted at before, the Surface Go comes with the cut-down Windows 10 S Mode enabled by default, which only lets you run apps from the Microsoft Store. You can unlock the software to the full Windows 10 experience for free, but you've got a few steps to go through – the Acer Swift 5, meanwhile, comes with the traditional Windows 10 desktop interface out of the box. Integrated Intel graphics is the order of the day on both the Microsoft Surface Go and the Acer Swift 5, so there's not much difference in terms of visuals – these two devices will do a perfectly fine job at rendering most applications, but intensive gaming at high frame rates is going to be out of the question whichever computer you get. The Surface Go is an appealing and affordable choice for anyone who wants the flexibility of a tablet that can also very easily be turned into a laptop device with the addition of a keyboard. It's solid, it's compact, and we like it a lot. The Acer Swift 5, on the other hand, is just about the lightest 15-inch laptop you're going to find on the market today. Despite its lightness and thinness, you can spec it out with top-level components, and it's going to give you a lot more performance grunt than the Surface Go is ever going to reach. It's really a question of going for the Acer if you need the best speeds possible, and going for the Surface Go if you need the portability and the tablet form factor – or something along those lines, anyway. Both devices have their strengths and weaknesses so you need to weigh up what you're going to use them for. Slightly complicating matters is the fact that the Acer Swift 5 hasn't gone on sale yet at the time of writing. It's scheduled to be released in Europe in November 2018 for a starting price of €1,099, hitting the US the following January, yours for $1,099. If you're on a budget, you might want to stick to the Surface Go.